I love this question because not only are they not all created equal – some of them are actually toxic (don’t worry, I’ll get to what I mean by toxic). Beyond being toxic, others don’t give adequate protection from UVA radiation, some can actually disrupt your hormones, and some break apart when hit by the sun, creating byproducts that can be both toxic and ineffective at sun protection. 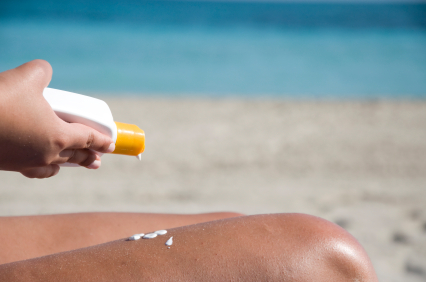 Ingredients can really make or break a sunscreen on its safety ratings. Luckily there are two main active ingredients you’ll really want to avoid: Oxybezone and Retinyl Palmitate (Vitamin A). Oxybenzone is absorbed into the bloodstream when put on the skin and disrupts hormones. More specifically, it acts like estrogen in the body which can cause all kinds of problems for you such as headaches, mood swings, and bloating. It’s also something that many people are allergic to, causing anything from rashes to difficulty breathing. Retinyl Palmitate (Vitamin A) is an important vitamin in general, but studies suggest that when placed on the skin, it may increase your risk for tumors and cancer. So any sunscreens with these in the ingredient list are out. Better ingredient options include zinc oxide, titanium oxide, avobenzone, and mexoryl SX (ecamsule). These are all compounds that will stay on your skin, provide some degree of protection from ultraviolet (UV) radiation (including UVA – the sun rays that increase aging and risk for cancer), and won’t absorb into your skin. Titanium and zinc oxides are the best options on this list as they both act as a block and protect against all UVA rays, whereas the other two don’t provide as much protection. All four have been shown to be non-toxic when used on the skin and to not break down when exposed to the sun. When looking at forms there are many options including creams, lotions, sprays, or sticks. However, not all are safe. I recommend “not to spray”. There’s no doubt sprays are easy and convenient (and certainly the most popular). Unfortunately, they may actually be damaging to the lungs as they are almost always inhaled when applied. Powders can pose health risks as well when inhaled, so avoid these too. Sticks are also not my favorite because people don’t tend to use enough to get good protection. I highly recommend sticking with creams and lotions. When it comes to SPF, it’s reasonable to assume the bigger the number, the better. Unfortunately, with SPF, this is not exactly the case. This is because the higher SPFs can give you a false sense of protection, tempting you to stay in the sun longer than you should with only one application. Though they often protect your skin from sunburn for longer periods of time, SPF only relates to UVB protection and not UVA protection (more on this in the next paragraph). You are better off getting an SPF of 15-50 and then reapplying more frequently. For these reasons, I don’t recommend using an SPF greater than 50. Now more on UVA and UVB. The SPF rating only indicates protection from UVB rays. Let me explain. The sun emits two types of rays: UVA and UVB. UVA are the ones that age our skin and increase the risk for skin cancer. UVB are the ones that burn the skin. It’s important to protect against both, but not all sunscreens do this. This means you can have a SPF of 70 that only protects you from sunburn but not from increased skin aging and skin cancer. That’s why you want to make sure you always look for the words “broad spectrum” on the label along with the SPF rating. I mainly recommend avoiding specialty sunscreens such as ones that include fragrances or insect repellant. This is because they often have chemicals that can absorb into your skin and cause health problems. There is one very clear exception. When you enjoy the sun while swimming or exercising, you decrease the longevity of your sunscreen, as it often washes right off with water or sweat. Using water resistant or sport sunscreens will increase the amount of protection when you are in the water or sweating. Though they may have some added ingredients that aren’t the best, the longevity of the sunscreen makes it a net gain. The good news is there are plenty of options (I’ll include the best that are available locally at the end of this article) that are plenty safe to use without much concern. You might be surprised to learn that the FDA doesn’t set any additional requirements for kids’ sunscreens. This is unfortunate because children have more sensitive skin and tend to burn more easily. I recommend using only kid-specific sunscreens that you have checked to be safe (see below for my recommendations and how to check if your sunscreen is safe for your kids). Furthermore, sunscreen is not typically recommended for use on infants and should only be used rarely in small amounts as a last resort. When you are going to use a sunscreen on a child, you should always check a small spot of skin with the sunscreen to make sure they do not react to it. Put a small amount on an arm or leg or the torso and then wait to see if they have any reaction. If they don’t, you can apply to the other areas that will be exposed to the sun. Protecting children from the sun is very important as a sunburn can double their lifetime risk of developing skin cancer. This is especially true for infants under six months old because their skin is not yet mature enough to protect them at all from UV damage. Keep all children well covered and protected from the sun as much as possible. Sunscreen is important but it isn’t the only thing you can do to protect your skin.Clothing, shade, and timing are your best defenses against sun damage. Clothing is better than any sunscreen, so start by covering up with a hat, long sleeves, and long pants. Eye protection is also crucial because your eyes are susceptible to UV damage as well. If you’re not wearing protective clothing, find or make shade while you enjoy the outdoors. 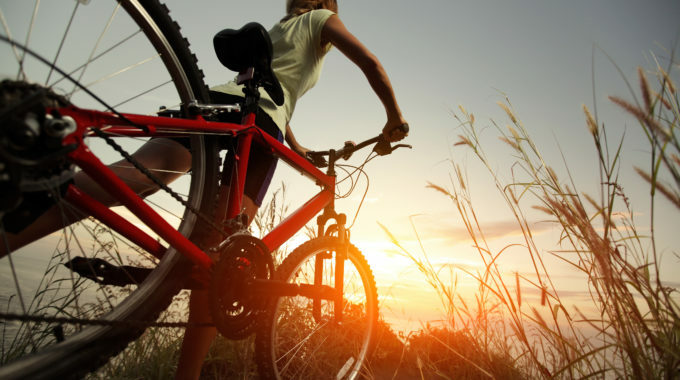 Finally, choose to go outside during the morning and late afternoon when the sun is less intense. What Sunscreen Can I Buy Right Now in Bozeman? To save you some hassle, I went around town to see what the stores in town are carrying. 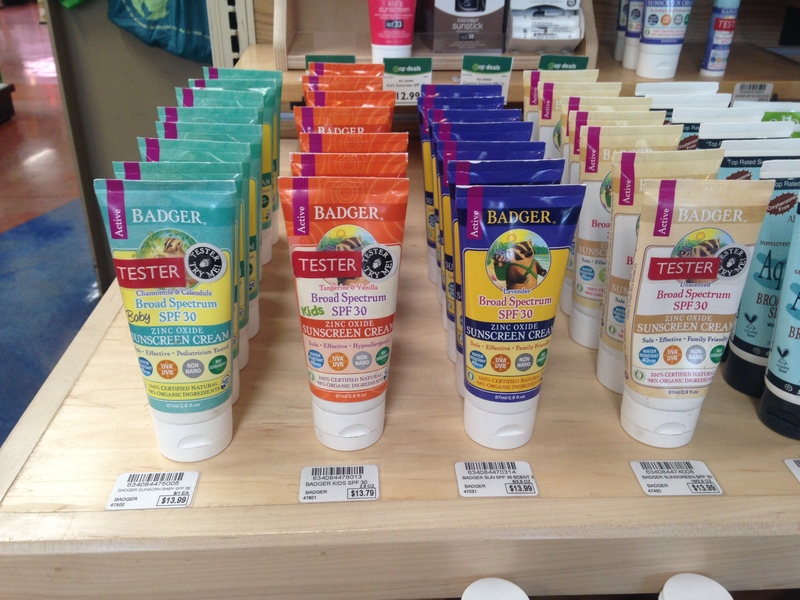 My current favorite brand is Badger because they get such consistently high ratings across the board from the EWG. And they have a great selection of Badger products at my favorite grocery store in town, the Community Food Co-op. 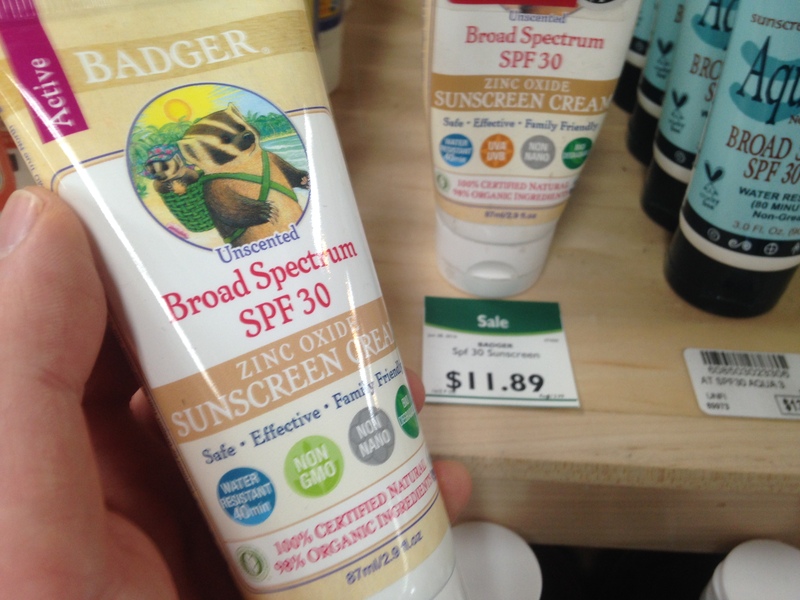 Favorite sunscreen + favorite grocery store = great combination! And right now they even have one of the most popular badger products, the Badger Active SPF 30 Unscented on sale for a great price (see the photo at left). 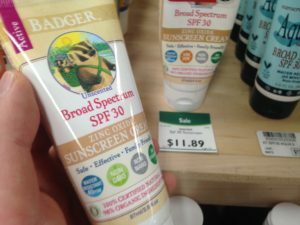 I hope this article makes your life a little easier this summer when it comes to choosing a sunscreen that is safe for you and your family. Hopefully you won’t have to wonder if you’re making the right choice — just go with my recommendations and you’ll know it’s Dr. Bacon-approved! 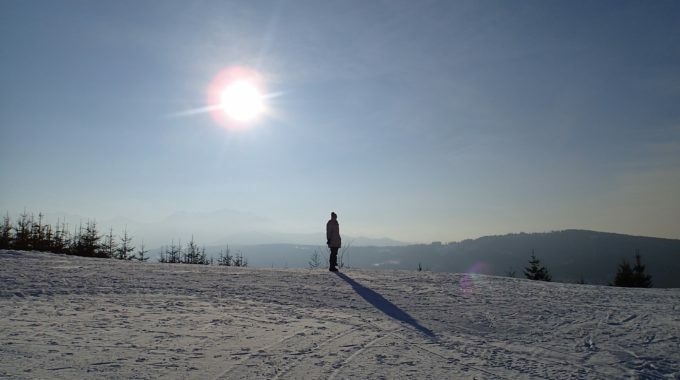 Are You Getting Enough Vitamin D at Bozeman’s Latitude? Thanks Dr. Bacon! It is overwhelming. I end up going with the most waterproof in the summer for swimming and sweating, but it seems like the most waterproof sunscreens have oxybenzone (my go to has been Coppertone Waterbabies). Do you have any specific very waterproof sunscreens that are zinc oxide based that I don’t have to go to a special store to find? 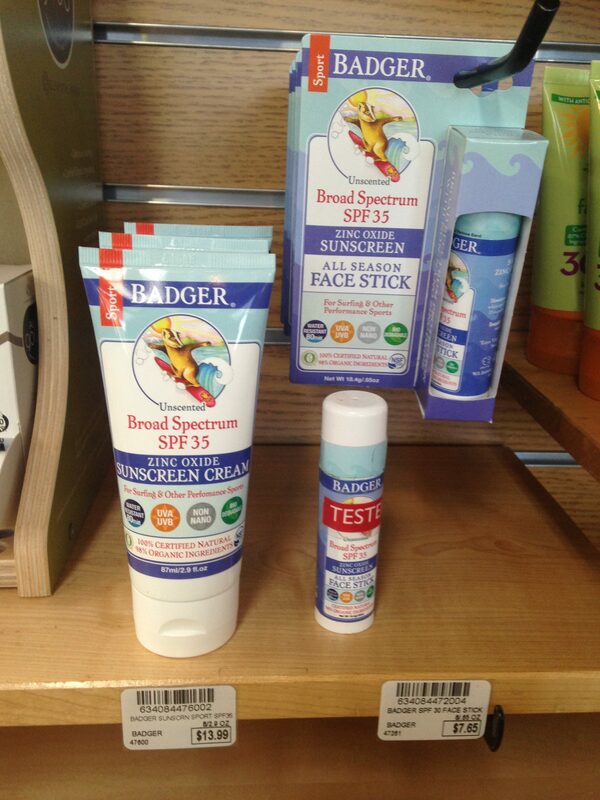 Another consideration if you are venturing to the tropics is reef safe sunscreen. We recently went to the Yucatan Peninsula and were pleased to see that a lot of snorkel tour operators police your sunscreen now if you sign up for their tours, but finding a good environmentally safe waterproof sunscreen is also overwhelming. I ordered one online and it was so greasy and didn’t last very long. Any suggestions there? next post: Are You Getting Enough Vitamin D at Bozeman’s Latitude?